*NO RESTRICTION* PLR #1: Traffic Tidal Wave! 35 Pages, No Restriction PLR! *NO RESTRICTION* PLR #2: Unleash The Financial Giant Within! 38 Pages, No Restriction PLR! Target Market/Demand: The target market is a no-brainer anyone who wishes to strike gold and make big money! Product Description:cash-raking strategies are everywhere! But why is it some people get rich easily and others struggle for years? It is because of the way your financial blueprint is wired. This book will show you how! 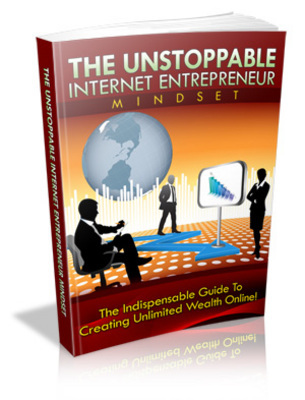 *NO RESTRICTION* PLR #3: The Unstoppable Internet Entrepreneur Mindset 41 Pages, No Restriction PLR! Product Description: Internet Marketers are more than just fly by night individuals. Gone are the days of making that quick buck and running from one location to another under a pet name. Its time to learn the art of building a long term business the right way! 1. You can put your name or pen name on the product as the author. 2. You can edit the contents of the product e.g. putting in your affiliate links, adding and removing text, inserting pictures and advertisements, etc. 3. You can change the title and sub-title of the product. 4. You can sell the product (E-Book) in PDF format. The suggested selling price is $27.00 $47.00. 5. You can break the contents of the product into articles for article submission purposes or add content to your website, blog or e-zine, and include your resource box. 6. You can spawn a series of short reports (free or paid) by breaking down the contents of the product. 7. You can add the product into a membership site (paid only). 8. You can add the product into your product bundle or package and sell for a higher price. 9. You can offer the Basic Resell Rights and/or Master Resell Rights to the PDF E-Book. The suggested selling price is $47.00 $67.00. By offering the resell rights, you CANNOT under any circumstances offer any Re-branding Rights selling the PDF form only. 10. You can produce audio/video content from the materials in this product. 12. You CAN offer the product as a bonus to another product you are selling. However, you can offer other bonuses to this product when selling. 13. You CAN sell the product on auction sites such as https://www.tradebit.com. 14. You CAN use nor sell this product in a dime sale event, under any circumstances at all. An event that constitutes a dime sale is one whereby the product starts selling at a very low price and increases every dime after a certain time frame or with every purchase using the dime sale script. 15. You CAN offer or give away, sell the Word Doc. in any way at all! 16. You CAN use the content for offline or physical book publishing! See Our Store For More Products! 3 Brand New Plr Ebooks Pack 4 Nov 2009!